(CNN) -- Three violent deaths in two stores marred the opening of the Christmas shopping season Friday. 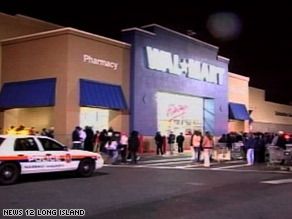 A Wal-Mart employee at this Long Island location was killed in a rush early Friday morning. In the first, a temporary Wal-Mart employee was trampled to death in a rush of thousands of early morning shoppers as he and other employees attempted to unlock the doors of a Long Island, New York, store at 5 a.m., police said. In the second, unrelated incident, two men were shot dead in a Toys "R" Us in Palm Desert, California, after they argued in the store, police said. The toy company and authorities said the California shootings had nothing to do with shopping on Black Friday, which is historically one of the year's busiest shopping days. The Wal-Mart worker, whom authorities did not identify, was 34 and lived in Queens, said Nassau County police Detective Lt. Michael Fleming. Video showed as many as a dozen people knocked to the floor in the stampede of people trying to get into the Wal-Mart store, Fleming said. The employee was "stepped on by hundreds of people" as other workers attempted to fight their way through the crowd, Fleming said. "Several minutes" passed before others were able to clear space around the man and attempt to render aid. Police arrived, and "as they were giving first aid, those police officers were also jostled and pushed," he said. "Shoppers ... were on a full-out run into the store," he said. The crowd had begun forming outside the store by 9 p.m. Thursday, Fleming said. By 5 a.m. Friday, when the doors were unlocked, there were 2,000 or so shoppers, many of whom "surged forward," breaking the doors, he said. The man was taken by ambulance to a hospital, where he was pronounced dead. Others in the crowd sustained minor injuries such as sprained ankles, Fleming said. A 28-year-old pregnant woman was taken to a hospital, but "the baby is going to be OK," Fleming said. She was to be released later in the day, he said. The California shootings occurred about 11:30 a.m. (2:30 p.m. ET), authorities said. By the time police arrived, two men were dead from gunshot wounds, Riverside County sheriff's Sgt. Dennis Gutierrez said. He said authorities are not seeking any other suspects. Gutierrez said that the men did not appear to be store employees and that the dispute appeared unrelated to shopping. "There was a confrontation inside of the store. But over a toy? I don't think that is accurate," he said. Two handguns were found near the men's bodies, Gutierrez said. In a written statement, Toys "R" Us spokeswoman Kathleen Waugh said the shooting appeared unrelated to the heavy shopping day. "Our understanding is that this act seems to have been the result of a personal dispute between the individuals involved," she said. She said company officials were "outraged" by the shooting and were working with authorities to find out what happened. He said authorities would not release the men's names until their families have been notified. Daniel Watson said he was at home with his children when his wife called from the Toys "R" Us store, where she and her mother were shopping. "All I could hear was gunshots in the back," he said. "She said, 'They're in here shooting.' I told her to run and hide, stay down and hide." He said his wife did just that, ducking under a clothes rack until the threat was over. Watson said neither woman was hurt. Asked about the possibility of criminal charges in the Wal-Mart death, Fleming said he would not rule it out but noted that charges would be "very difficult," as it would be "almost impossible" to identify people in the crowd from the video, and those in the front of the crowd were pushed by those behind them. Hundreds of people may have lined up in an orderly fashion but got caught up in the rush, he said. Wal-Mart spokesman Kelly Cheeseman issued a statement saying, "We are saddened to report that a gentleman who was working for a temporary agency on our behalf died at the store and a few other customers were injured. Our thoughts and prayers are with their families at this difficult time." The company is investigating the incident, the statement said. Officers patrolling the shopping center overnight had had concerns about the size of the crowd, Fleming said, and had tried to get those in line better organized. Wal-Mart security officers were also present overnight, but he said he did not know how many. "I don't know what it's worth to Wal-Mart or to any of these stores that run these sales events," Fleming said, "but it has become common knowledge that large crowds do gather on the Friday after Thanksgiving in response to these sales and in an effort to do their holiday shopping at the cheapest prices. "I think it is incumbent upon the commercial establishments to recognize that this has the potential to occur at any store. Today, it happened to be Wal-Mart. It could have been any other store where hundreds and hundreds of people gather." Asked whether the security had been adequate, Fleming said, "In light of the outcome, in hindsight, the answer is obviously no. ... This crowd was out of control." CNN's Rosalina Nieves contributed to this report.